Why Stay With Us?Why Stay With Us? in the  Top 1% of Hotels in America! A truly magnificent Sea Captain’s home near Cape Cod bay, our historic bed and breakfast has been totally restored and refurbished with luxurious appointments and new air-conditioning. 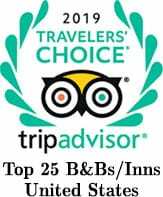 We are a top rated Bed and Breakfast in Brewster and Cape Cod and have received the Trip Adviser certificate of Excellence for the past 7 years and are the ABSOLUTE best place to stay on Cape Cod! You will find rich and intimate guest quarters reflective of this beautiful seaside Cape Cod Bed and Breakfast. Our Brewster boutique inn has a perfect location, with easy strolls to Breakwater Beach, the Brewster General Store and Ice Cream Scoop, upscale restaurants and close access to the bike path. A wrap around porch with a screened in breakfast area overlooking the pool makes for a perfect start to the day and then relaxing in wicker lounge chairs and rocking chairs on the front porch defines the perfect vacation. Breakfast is both gourmet and farm to table and is accomplished in a commercial kitchen. An indoor dining room makes breakfast and afternoon teas a year round pleasure and summer finds you eating breakfast outside in a covered screen in porch overlooking a serene pool, gardens and songbirds feasting from the feeders. The guest rooms are uncluttered, light filled, spacious and well equipped with modern amenities, including wi-fi throughout the property and a solar heated salt water pool. 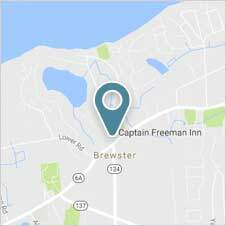 Our Brewster bed and breakfast, the Captain Freeman Inn, is one of the best hotels in Brewster, Ma, providing luxurious 600 thread count sheets and turkish towels, artisan handmade amenities for your Cape Cod getaway. Brewster is perfectly located on Cape Cod, central to all the parts of the Cape that millions of visitors have enthused over….. 45 minutes to Provincetown, 20 minutes to the start of the National Seashore Beaches, 20 minutes to the upscale town of Chatham, 25 minutes to the ferries out of Hyannis for day trips to Nantucket and Martha’s Vineyard and just over an hour to the other end of Cape Cod at Wood’s Hole. Exhaling on Cape Cod for that perfect getaway!